Close to Anduze and Saint Jean du Gard, the Canyon du Soucy is located in the Cévennes not far from the famous Stevenson path. You will discover a beautiful aquatic hike in the Gardon river. 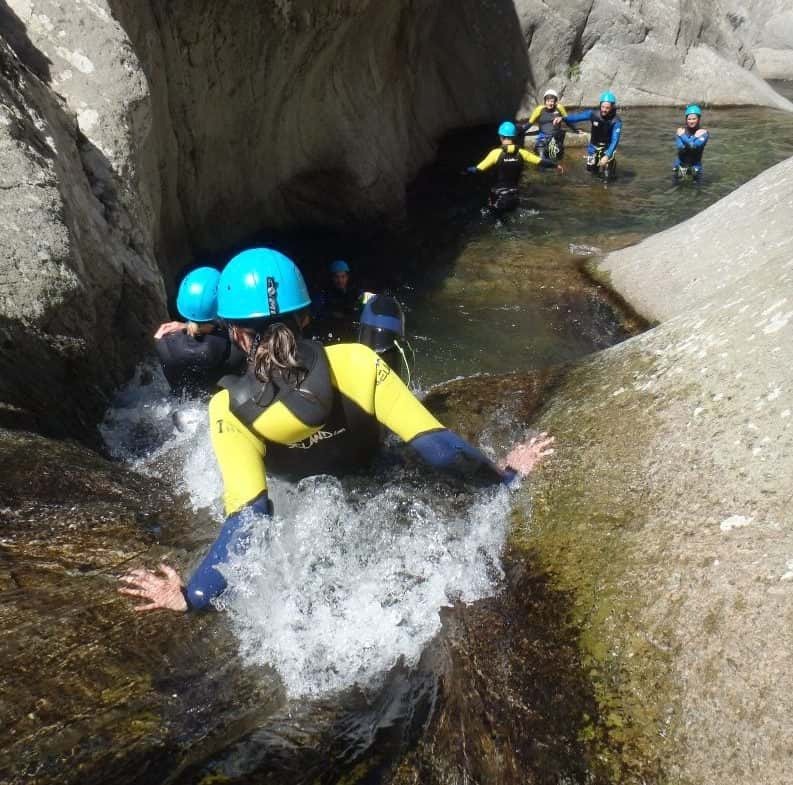 The water has carved the rock creating an exeptional course to enjoy with family and friends as an introduction to canyoning. It’s a discovery canyoning. It is possible from the age of 6. You will begin with a beautiful approach walk of about 35 minutes in a typical landscape of the Cevennes. The start is at the level of a magnificent Roman bridge overlooking the Gardon river. We then slip into our neoprene suits to jump into the water. There is something for all levels. From beginners to athletes, many jumps from 1 to 10m are waiting for you. Rest assured, there is nothing compulsory. Some water slides are available to you and a large zipline at the halfway point will delight everyone. This activity which can be done from the age of 6 is done either in the morning at 9:30 or in the afternoon at 14:00. The meeting location is in Saint-Jean-du-Gard in front of La Poste (Post Office). It starts with a 40-minute hike. You are in the canyon for 3 hours of fun guided by a certified instructor. It ends with a 10-minute hike. All the technical gear is brought and lent by the guide. We will ask you to give us the height and weight of each participant to pick a neoprene suit adapted to your morphology. Each participant needs to bring a swimsuit, a towel, a pair of sneakers/trainers and a bottle of water. We accept payments in cash, cheques-vacances and cheques but NO credit cards. If the activity that you want to do is not in the schedule above, you can directly contact us to create a new slot, by calling us at +33 7 83 82 61 22 or by writing a message using the contact form below. The price includes the service of a certified instructor and the rent of technical gear. The minimum number of participants is 5.